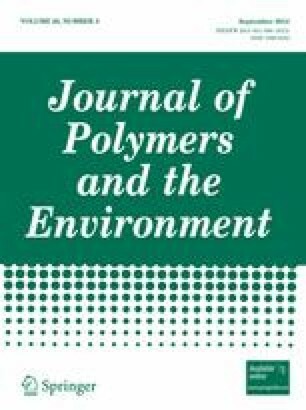 Poly(lactic acid) (PLA) has been modified using twin-screw reactive extrusion to improve its melt properties and crystallinity. In this work lauroyl peroxide was used as an alkyl free radical source, abstracting hydrogen atoms from the PLA backbone leading to branching and chain extension reactions. Once the linear viscoelastic region was determined for these polymers, changes in dynamic rheology (dynamic viscosity real and loss modulus) were measured. Gel permeation chromatography showed that the molecular weight and polydispersity increased to a maximum with the addition of 1.00 and 0.50 wt% peroxide, respectively. Low temperature β transitions in dynamical mechanical thermal traces gave further evidence that branching had also occurred. Göttfert Rheotens measurements showed a three fold increase in melt strength due to both increased chain length and branching. Thermal analysis showed the level of crystallisation had decreased also possibly due to branching. Reductions in crystallinity and improved melt strength are known to be critical for film and foam formation. An erratum to this article can be found at http://dx.doi.org/10.1007/s10924-012-0537-z.